See also Wikipedia's article about "Hamilton Hall (Columbia University)". 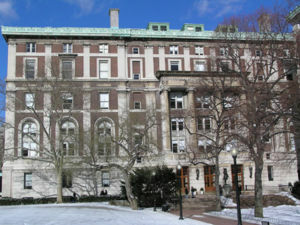 Hamilton Hall is the headquarters of Columbia College, and as such holds the office of the College Dean, the Admissions Office and the office of the Core Curriculum. Hamilton is also home to a number of humanities departments, and is where many humanities classes, especially those in the Core Curriculum, are held. 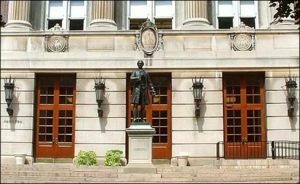 The building is named after famed Columbia dropout Alexander Hamilton, whose visage graces a smart statue out front, itself the work of alumnus William Ordway Partridge. There is also a daycare center in the basement for children of university employees. Eventually John Stewart Kennedy, a trustee of the University and a New York philanthropist donated the money to erect a building. His name is inscribed on the floor of Hamilton's lobby (though it's usually hidden under a mat). 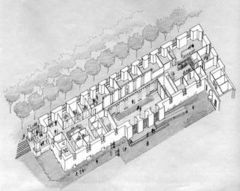 By this point there wasn't even any space left on the original campus, which only consisted of the area between 116th and 120th streets. It wasn't until October 1903 that Columbia bought the next two empty blocks to keep encroaching developement from arriving at their front steps. It was on this new plot of land that, on September 27, 1905, the cornerstone was laid for Hamilton Hall. Designed by campus architects McKim, Mead & White, the College's building was finally complete by 1907. Early Hamilton contained a well appointed lounge for Columbia College students known as the Gemot, furnished by the Class of 1881, that occupied the northern half of the basement. At some point in the early 20th century the building also boasted a "College Study", more or less a library/study space for college students. The high-ceilinged study was closed when more of the building space was converted into classrooms, and rebuilt into eastern halves the third and fourth floors. The fate of the stained-glass widow is unknown. Two limestone tablets on the southern (front) side of the building, one to the west of the entrance, and one to the east, indicate a time in which Hamilton was covered in ivy. Each sports a crown and an inscription of either "1911 Ivy" or "1909 Ivy," indicating he classes that planted the respective Class Ivy. Hidden beside each of the main doors of Hamilton are heavy ornate iron gates, gifts of the Class of 1880. They were restored as part of the major renovations of the building in 2000-2004. As the administrative center of the College, Hamilton, like the university center of Low Library, has been subject to various protests' attempts, some successful, to occupy it in order to fulfill some demand or another. The first and most famous such takeover occurred in 1968. The famous protests of that year began when students took over the building and imprisoned acting College Dean Henry Coleman in his first floor office. The 1968 protests escalated when black protesters declared Hamilton their turf, ejecting whites to Low. Subsequent takeover attempts have traditionally involved attempts to broaden the College's and the university's curricular offerings in various ethnic studies programs, or to expand administrative support for minority students. This is perhaps why the Center for the Study of Ethnicity and Race is located in Hamilton today. Recurrent blockades or occupations occurred in 1969 (over delays in setting up African-American Studies), 1972 (for Latino Studies), 1985 (during a protest for university divestment from South Africa during apartheid), 1987 (after a racially-motivated beating shocked campus), 1992 (to protest Columbia's plans to develop the site of the Audubon Ballroom) and 1996 (when students went on a hunger strike to demand an Ethnic Studies department). In each case, the protesting students' demands were met, though often years (and sometimes decades) later. Starting in 2000, Hamilton underwent a 4 year $25 million makeover. Many of its classrooms were gutted and renovated (many of the rooms have sponsors; look for the plaques outside each room). 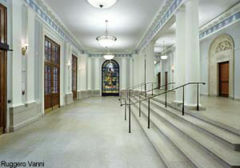 The lobby also got a major face lift, with a new marble floor, fresh paint, and new lighting fixtures. No one got the memo that an empty lobby opening on 3 closed doors isn't all that impressive or welcoming. However, Dean Quigley did manage to dig up two awesome Tiffany stained glass windows to have installed in the lobby. More than a century old, the pieces represent Lit Hum authors Virgil and Sophocles. The windows had been graduation gifts from the Classes of 1885 and 1891, and were originally installed in the library at the midtown campus. Following the move uptown, the windows had been installed in the main lounge of Hartley Hall, but were removed during renovations in 1948, oddly enough at the request of Marcellus Hartley Dodge, who had donated the building on his graduation in 1903, and was paying for its renovation. The windows, along with display cabinets near either stairwell with a timeline and artifacts from the history of the Core Curriculum fulfilled Dean Quigley’s goal of creating "a display area for the history of the College and the Core." Having a class on the upper reaches of the building sentences one to an excruciating stair climb or a long wait for the one tiny elevator. Students have been known to select Lit Hum and CC classes solely on the basis of the least flights of stairs to climb. Incomprehensibly, the most spacious classrooms are at the top of the building, meaning the greater proportion of students using Hamilton have a long vertical journey. Empty Hamilton rooms are open for studying in the evenings during finals, and are often used as club meeting spaces during the semester. The basement bathrooms are among the nicest on campus, with the possible exception of the marble lavatories of Low Library. These are probably left over from the Gemot lounge (see above). Hamilton's cornerstone, located at about eye level to the left of the main entrance, is inscribed in Latin "Huius Colegii Olim Regalis Nunc Columbiae Dicti Regio Diplomate An Dom MDCCLIIII Constituti In Honorem Dei Optimi Maximi Atq In Ecclesiae Reqi Publicae Emolumentum Primus Hic Lapis Positus Est Sept. Die XXVII An Dom MDCCCCIV." ("This first stone of this College, once called King's now Columbia, established by royal charter Anno Domini 1754 to the honor of Almighty God and the advancement of Church and State, was laid September 27, Anno Domini 1905.") The inscription is similar to the one on the cornerstone of College Hall, which was disinterred before the building was demolished in 1857 and transported first to the Midtown campus, and eventually to Morningside Heights, where it was set above the fireplace of the Trustees Room in Low Library. Above each of the three entrances to Hamilton is a carving of the Columbia Seal. They go chronologically from left to right, the first being the seal of King's College (Colegii Reg), the second being the seal of the State University of New York (as Columbia was chartered from 1784-1787), and the third being the current seal of Columbia. Enter through the south entrance to the building, then take the west staircase downstairs. The door is right in front of the staircase and is very obvious. Kent is straight through, with many other buildings beyond. There are no alarms or cameras. It is an "access route" so it is usually unlocked, and is possibly legal. Note that there is constant staff presence in the basement. You can see this connection on the Hartley side of the door, but it is triple padlocked and welded shut. This is possibly due to the 1968 Riots. The Hamilton side would be in the daycare center, so good luck there. This page was last modified on 1 August 2016, at 20:56. This page has been accessed 19,440 times.